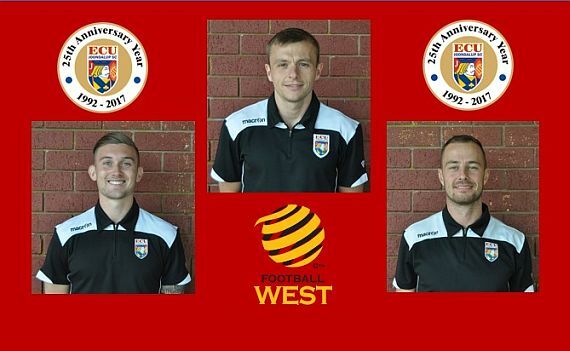 ECU Joondalup players Ross Millard, Daryl Nicol and Gordon Smith have all been selected in Ramon Falzon’s 2017 WA State League squad for the upcoming games against Perth Glory, the Young Socceroos and the Singapore under 20’s later in the season. For Millard, who joined the Jacks from Perth Glory this season, he said it’s a huge honour to represent your state and he’s looking forward to it. “It’s good to be recognised for having a strong season personally, and the chance to play mid-week games against some quality opposition will be a good experience as well as being able to come together with players from other state league clubs,” he explained. “All the games are near the end of the NPL season so the schedule is pretty full on but you want to be playing in these type of games, and it will be good exposure for the league. “It’s a great opportunity to test ourselves against different types of opposition from both here and overseas. The group that Ramon has got together is strong squad which no doubt will be competitive, we had our first training session on Wednesday night so it was good to get around everyone and begin preparation for what will be a challenging few weeks. The squad is looking good, there’s quality all over the park so we should have no trouble executing the way that Ramon wants us to play. Nicol joined the Jacks last season, after emigrating for Scotland where he was top scorer for Cove Rangers, said it will be great occasion. “I’m delighted to be selected in the WA state squad along with my teammates Ross and Gordon. I’m very excited about the thought of playing against such a high caliber of opposition but also excited about getting the chance to play alongside some of the best players in our league,” he said. Smith, who is currently recovering from injury, said it’s great to be selected but he wants to be back for the Jacks as quick as possible, and that’s his priority. “I’m delighted to be selected for the state team again, it’s always good to get the opportunity to represent the state and play against top sides and something Ross, Daryl and myself are looking forward too,” he said.